Ο Οργανισμός μας με την στήριξη του ιδρυτή του MONEY SHOW, κου Ηλία Φαραγγιτάκη, συμμετέχει σε ένα από τα μεγαλύτερα events της πόλης μας. Ο οργανισμός μας χαίρει αναγνώρησης από σημαντικούς φορείς και από τον επαγγελματικό κόσμο που στήριξε την παρουσία μας. Μαζί με το Money Show, κύριος Χορηγός μας η αλυσίδα μεσιτικών γραφείων REMAX CHOICE του κου Νίκου Κουρτίδη, η κα Έλσα Βρουκιά από το Label Tag και ο κος Αριστομένης Ελεμίνογλου "Άδειες Λειτουργίας". Ευχαριστούμε που μας βοηθήσατε στην πραγματοποίηση αυτής της σημαντικής εκδήλωσης. 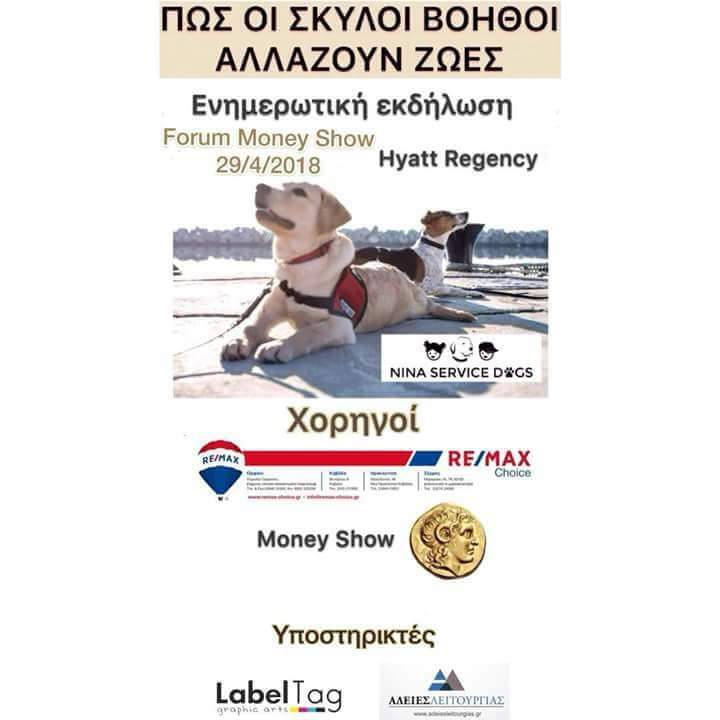 During the MONEY SHOW, which took place in Hyatt Recency Hotel on Sunday the 29th of April 2018, the members of the non-profit organisation Nina Service Dogs presented in front of a large audience, the services of service dogs and how these can improve the lives of individuals with disabilities. During the event, the founder of the organisation; ms. Palagka Eleni, talked about the training of service dogs, the first two service dogs that had been trained for two years and then given to two individuals with disabilities in Greece, as well as the certified session assistance dogs, which regularly visit institutions. The seven year old George Manis, together with his family and service dog, was present in the event and together, they shared their experience of owning a service dog and the impact Mike the service dog had in their lives. Speech therapist; Papapouliou Dionisia, shared her experience from the session with a fifth grade student diagnosed with autism. Alexanda Papadimitriou and her family talked about their desire to get their own service dog. Papadopoulou Irene, the co-founder of Nina Service Dogs mentioned the difficulties they are facing with finding sponsorships and informed the audience about the legislation. Police dog handler; Vasilis Anastasiadis, who is also one of the organisation's volunteers, spoke about the cooperation between the organisation and the Greek Police and explained how retired police dogs can become session assistance dogs for the elderly and other sensitive groups of people. Parliament member Alexandros Triantafillidis attended the event and expressed his admiration about everything Nina Service Dogs has achieved up to now. We thank our sponsors, mr. Nikos Kourtidis from Remax Choice, mr. Faragitakis Ilias, founder of the Money Show and our supporters mrs. Elsa Vroukia from Label Tag and mr. Aristomenis Eleminoglou from Adies Litourgias.